Dead people can’t sue or answer back. Maybe that’s why supporters of Brexit thought they could get away with fabricating a quote by Winston Churchill to support Britain leaving the European Union. Increasingly doing the rounds in the lead-up to Britain’s EU referendum is a quote by Churchill which it is claimed he said to Parliament on 11 May 1953 when he was Britain’s Prime Minster. The quote or variants of it, usually depicted alongside a photo of Churchill, is being heavily promoted on social media such as Twitter and Facebook, and quoted in readers commentsin multiple newspapers and blogs, usually by UKIP supporters. 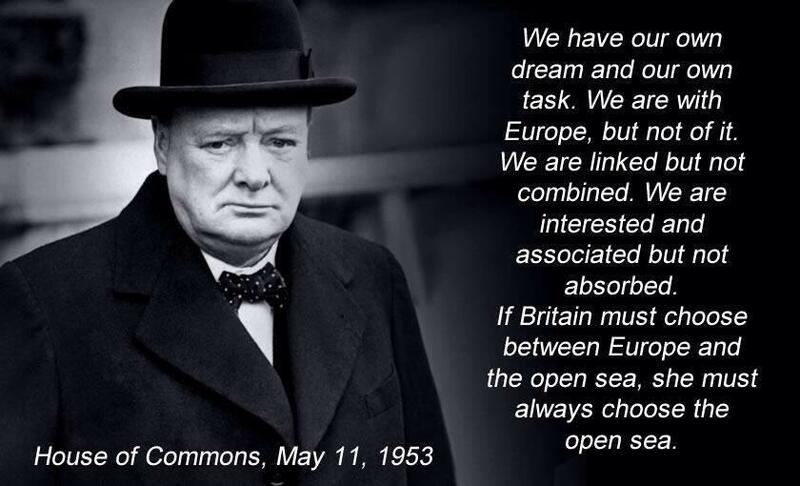 The quote is being used to prove that Churchill would never have supported Britain’s membership of the EU, and that if he were alive now, he would be against the concept of today’s European Union and vote for Brexit in June’s referendum. The problem with this quote is that it’s a deception. Brexit supporters have fabricated it by ‘stitching’ together two different quotes by Churchill, said by him at different times and in different contexts. The authors of this ‘stitch up’ have then falsely claimed that Churchill made this announcement in Parliament in 1953 as a reason for Britain not to join the emerging European Community. In this way, Brexit supporters have posthumously ‘recruited’ Churchill as a backer of Britain leaving the EU in the forthcoming referendum. So, let’s unravel this crude duplicity and betrayal of Britain’s greatest war leader. The first four sentences of the ‘quote’ were not said by Churchill in Parliament in 1953, but written by him 23 years earlier, in February 1930, for America’s Saturday Evening Post. Ironically, the title of Churchill’s article in 1930 was ‘The United States of Europe’ – a concept which he passionately supported. Churchill considered that a truly united Europe would be the antidote to war and the path to greater security and prosperity for the continent. This in turn would be of considerable value to Britain, wrote Churchill. His article was remarkably prescient, as it outlined a blueprint for today’s European Union. Churchill concluded that, “the concept of a United States of Europe is right.” His article imagined a Europe without internal barriers or tariffs, or passports, or multiple currencies, which would enable the “free interchange of goods and services” and the free travel of people across the continent. And the idea of “European unity” was not new. “Europe has known the days when Rumanians lived on the Tyne and Spaniards on the Danube as equal citizens of a single state,” wrote Churchill, reminding his American readers of the Roman Empire. It was clear from his article, however, that at that time Churchill did not envisage Britain – which then headed a huge Empire and Commonwealth straddling the world – needing or wanting to be part of a ‘United States of Europe’. It’s from this article that Brexit supporters have taken four sentences and claimed that instead of 1930, Churchill spoke them to Parliament in 1953. He did not. “We are bound to further every honest and practical step to which the nations of Europe may make to reduce barriers which divide them and to nourish their common interests and their common welfare. “We rejoice at every diminution of the internal tariffs and the martial armaments of Europe. We see nothing but good and hope in a richer, freer, more contented European commonality. Churchill’s view in 1930 would be bound to change by the 1950s, by which time Europe had endured a second devastating world war and was desperate to avoid another. (More of that shortly). The French leader, Charles de Gaulle, was flown from Algiers to London to be briefed on the battle plans called ‘Operation Overlord’. But Churchill became exasperated with de Gaulle’s apparent obstinacy and brinkmanship, and wanted to demonstrate his strong loyalty to US President, Franklin Roosevelt, without whose help Britain – and Europe – would be lost. Brexit supporters should not have taken a quote by Churchill yelled in anger during the war and falsely claimed that he said it as part of a considered speech to Parliament eight years after the war had ended. In fact, the entire quote now being promoted by Brexit supporters to claim Churchill’s support for their cause is nothing other than a misleading concoction. It is, however, true that in the early 1950s Churchill did not support Britain’s membership of the emerging European Community. It was clear that Churchill’s opposition was not a principled one, but a practical one. All that was to change during the course of the 1950s and 1960s, when it became clear that Britain’s Empire had finished and its Commonwealth was diminished. In March 1957 the six nations of France, Italy, West Germany, Belgium, the Netherlands and Luxembourg founded the European Economic Community (later to be renamed the European Union). Brexit campaigners, however, are increasingly using Churchill’s words and images to recruit his memory to their side. Recently, for example, ‘Vote.Leave’ launched a videopresenting the case for Britain’s exit from the EU, and featured Winston Churchill alongside other famous British heroes. But Churchill’s grandson, Sir Nicholas Soames, launched a scathing attack against this use of the war leader’s words and images in support of Brexit. He said that they had no right to use his grandfather in this way and suggested that Churchill’s views would never have aligned with their campaign. Fortunately, truth usually prevails in the end. This entry was posted in Jon Danzig, myths and tagged Jon Danzig, myths. Bookmark the permalink.